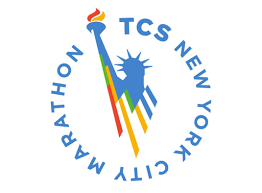 On Sunday, November 1, I completed the 2015 TCS New York City Marathon, my 68th race of marathon or ultra-marathon distance. I headed into this race with limited training. Back in August, I completed the Beast of Burden 100-mile ultramarathon in bad shape, having unwittingly strained my hip adducters, and it took three or four weeks to recover. As this injury gradually healed, I developed a stress reaction in my left foot from barefoot running. On any given day, it seemed that if one injury felt better, the other was worse. I backed off, and both injuries healed, but September and October were lost to serious training. My running log showed no long runs since July, no quarter-mile splits since June, no Yasso splits since early May, and I couldn’t even remember the last time I had run on pavement. 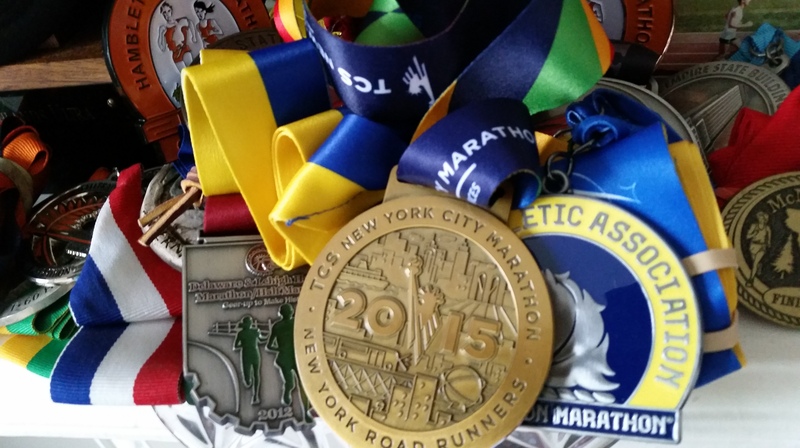 As the NYC Marathon drew close, I considered skipping it. Out of my last eight road marathons, I had set new PRs at all but one, and in the last three races I had broken psychologically important 3-hour barrier, the result of several years of disciplined, consistent training and effort. I didn’t want a poor performance at NYC to break this streak or jeopardize my status as a sub-3 hour racer. But upon reflection, it seemed wrongheaded that numeric goals would become so important that they’d drive me to avoid important races. Further, I wanted to honor all my friends who were participating, including one in particular, Ilana Adelman, who was undertaking her first-ever marathon. How could I skip my 68th when she was stepping up to her first? To shock myself back into some semblance of marathon shape, I decided to run the Hambletonian Marathon two weeks prior to NYC. To make life interesting, I did so after a night of barefoot hiking and following a 24-hour fast. People asked if this was “optimal,” but there was method to my madness, specifically, I wanted to reacquaint my legs with the distance without racing so hard as to jeopardize NYC. The plan was unconventional, but it worked: average pace was 8:12, in line with target of 8:00. And now NYC was just a few days out. There was at least one factor playing in my favor: near perfect conditions. Last year, NYC runners had been buffeted by headwinds and cold temps. This year, the forecast for Sunday was mid-50’s, with little wind. After thinking things over, I gave myself permission to race NYC hard. Goal #1 would be to break 3 hours and sustain the streak. Goal #2 would be to do the best I could. When you race you are under oath. You are testifying as to who you are. The evening before, I reviewed the pace plan, laid out gear, and went to bed early. The alarm went off at 5:00 AM. Breakfast was bacon and eggs chased with a double espresso. I made it to the assigned bus without mishap. At the marathon village on Staten Island, I did a little easy warming up, and then it was time to dash into the corals before they closed. When the cannon went off, I couldn’t read my GPS watch because the first mile and a half were on the lower level of the Staten Island bridge. Running by feel, I was a few seconds ahead of plan when GPS connection was reestablished, and per plan, brought the pace down over the next few miles from 7:30 to target of 6:40. Sweat was running down my face. I took off my hat and felt better. At the next mile marker, the watch showed I was slipping a few seconds behind plan, with miles ranging between 6:43 and 6:47. That was OK, because the pace plan had a 90-second cushion built in against the all-important sub-3 hour goal. Often in a marathon, the first few miles feel a little grim. It’s a strain to hang on to target pace, and way too early to look ahead to the finish. Today, however, I was in good spirits. I kept myself focused on the here and now: just trying to run each mile as close to goal as possible, and enjoying the bands and cheering crowds out of the corner of one eye — while looking straight ahead, trying to pick out the distant turns so I could align myself with the surveyor’s tangent and avoid running extra distance. At mile 5, I was about 15 seconds behind plan, which was good, and the next few miles passed quickly. I passed the half-way mark in 1:31. With a little effort in the second half, I could still slip by under the three-hour mark. The Queensboro Bridge is an obstacle, with the grade rising 200 feet over a mile and a half. Typically I’m a strong climber, and this time, too, I passed a number of runners, including a few who had slowed to a walk. This section, too, is under cover, and GPS connectivity was lost. I just pushed on as hard as I could, my face tensing as a faint feeling of despair welled up in my heart: I could sense goal #1 was slipping out of reach. When the bridge finally turned downhill, I tried to pick up the pace to make up for lost time, but now I could feel my form was deteriorating. I was beginning to land on mid-foot instead of forefoot. I got a burst of energy from my friend Norman Goluskin, who cheered me on as I made the turn onto 3rd avenue, but shortly thereafter the watch showed pace slowing to a 7-minute mile. Looking out into the distance, I could see there was a long gradual downhill, and I pushed harder, but only just made it back to target — I couldn’t sustain the pace when the course leveled out again and turned up ever so slightly. Around mile 17, my energy began to sag. I don’t eat or drink during marathons, believing that I’m better off developing fat-burning capabilities rather than relying on processed sugar. I could have grabbed a gel from one of the aid stations, and I thought about this briefly, but dismissed the idea as unpalatable and disrespectful to the 60% of Americans who are diabetic or pre-diabetic. After a mile, my energy kicked back in, as if my body, having depleted its carbohydrate stores, had paused for a moment before reluctantly shifting to full fat burning mode, and for a moment my pace accelerated, in fact my watched showed 6:30, but my legs and back were beginning to hurt, and the next glance showed a pace well above 7:00. The 3:05 pace group leader flew past me. I stopped looking at my watch, figuring it would no longer be productive. If I couldn’t break 3 hours, so be it, I would do the best I could; I wanted family and friends to be proud of my performance, whatever it was. At mile 20, a young man in dreadlocks passed me. He was running barefoot. I learned later through friends that his name is Alex Ramsey and he had just completed a 900-mile run from Chicago. I made it to mile 24, struggling with fluctuating energy levels and increasing pain. And then cramps hit, twisting my right foot around, and signaling that I had asked more of my muscles than they were prepared to deliver. Recognizing this, I concentrated on relaxing and slowed further. Finally, the finish line was in view, and I sprinted the last 0.2 miles. I finished in 3:09, or ten minutes behind last year’s performance. As you can see from the pace chart, I was close to plan for the first half, then fell behind in the second. That’s a great example of the consequences of racing undertrained, and now I have a clearer understanding of the magnitude of the effect. Having said that, nothing ventured, nothing gained. While the time wasn’t my best, I felt great about the effort. As the second chart shows, my heart rate was 5-10 beats per minute higher compared to my last two races. This suggests that I’ve got extra cardiovascular energy that I can comfortably put to work, provided my legs are in strong enough condition. This bodes well for future races. A number of friends participated in the race. 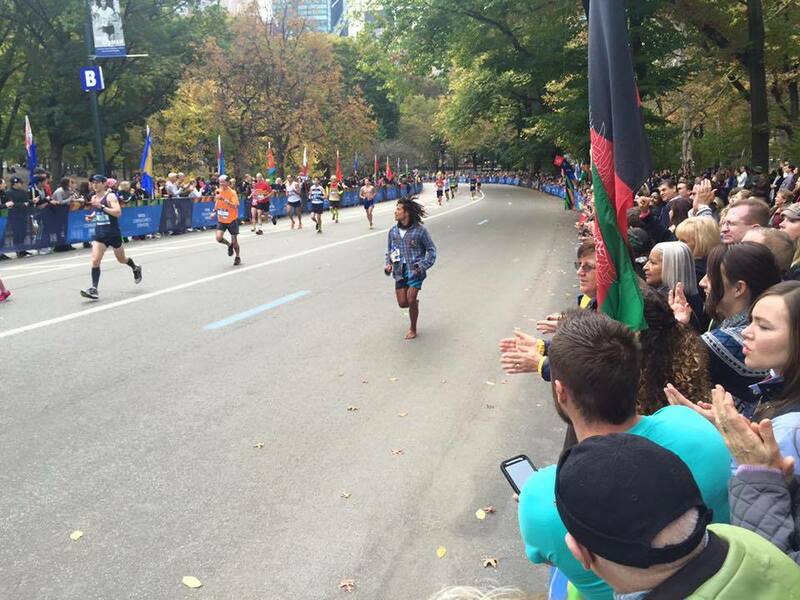 Of note, Andy Udis completed his 23rd NYC marathon, and Alan Ruben completed his 28th. And I’m especially proud of Ilana, who successfully completed her first marathon. I had a good experience at Boston earlier this year, and I’ll take another shot at improving my road marathon PR there in April 2016. I have a question about your not drinking during a marathon. I can accept not eating as a strategy based on the physiology of using fat as an energy source but what benefit would you get from not drinking that would out weigh the risks of dehydration? Thanks. I wrote an article about hydration for the Trail Walker (http://www.nynjtc.org/news/hydration-hikers) a few years ago, and documented a disagreement between the American College of Sports Medicine and the International Marathon Medical Directors’ Association about how best to hydrate during a marathon. Despite their difference of opinions, their underlying assumption is that runners in a marathon will get thirsty at some point. I get thirsty after running far shorter differences and found your ability to go the distance without even drinking one drop quite interesting. I would imagine that you have gotten good at starting well hydrated, though. I will look into the book suggestion.